Maybe fixes "Zero Visibility of Underwater" problem. This mod makes visible some underwater which have the "zero visibility of underwater" problem. 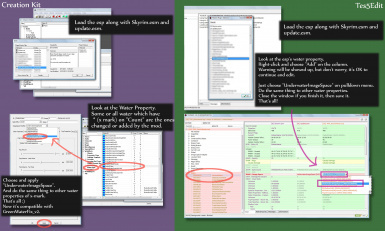 Notice: If you don't have "totally blind underwater" problem", this mod do NOTHING. 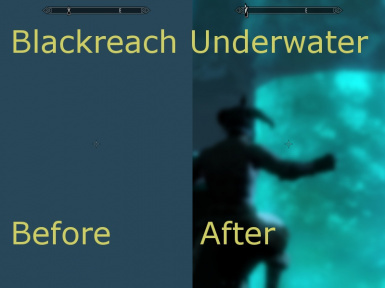 This mod is NOT made to change underwater from blurry view to clear one. 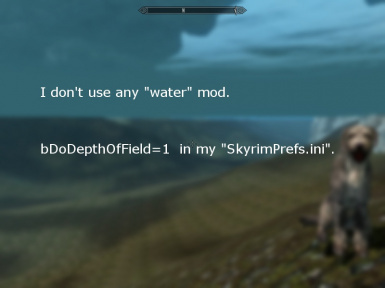 This mod DOES NOT normalize "underwater". Original underwater blurring will be lost. 1.Anywhere, in case of Vanilla. If your savegame doesn't work with this mod, fast travel to far place several times. And try console command "PCB" (Purge Cell Buffer) in interior cell, and after, fast travel to somewhere. It's for updating cell data. 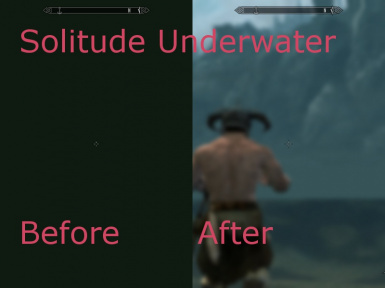 This mod conflicts any mod changes "UnderwaterImageSpace". But enabling those mod's "Depth of Field>No Sky" in CK by yourself, it's all compatible. When you do so, no need to use my mod. Make sure to deactivate it. "bDoDepthOfField=0" setting also makes underwater visible. But you will lose your ENB settings of DoF. And also it makes your underwater no color, and no blur. So, I recommend you "bDoDepthOfField=1" when using my mod. If you choose "bDoDepthOfField=0" setting, please deactivate my mod. It doesn't need any more. And very thanks to SonnyWiFiHr, who discoverd and told me the "No Sky" tips! but all I ask in return is that you give me credit if you distribute any part of this mod. For those who have a problem about "Zero Visibility of Underwater". 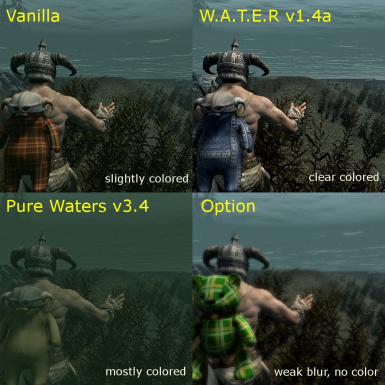 Thanks to OpticShooter, now compatible with "WATER - Water And Terrain Enhancement Redux"
Thanks to Laast, now compatible with "Pure Waters"
In Skyrim with 1.5 patch, I have a problem about underwater. I can see NOTHING. Completely. All is green. Only green. Sometimes white. And I drowned. After a little struggle, I found a solution about it. Some people seem to have the same problem, so I decided to share this esp. Value of "Near Plane" >(greater than) Value of "Far Plane"
I discovered this solution, but I don't know why this can fix Underwater problem. I hope Bethesda official fix for this problem is released soon. If you DON'T have the "Underwater Green" problem, DON'T USE THIS MOD. 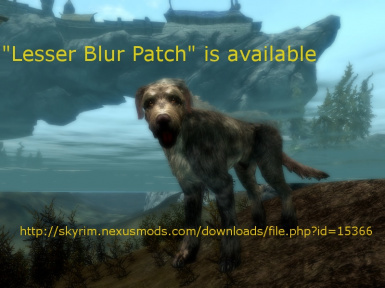 Please load this mod AFTER "WATER - Water And Terrain Enhancement Redux". Make sure that you load my mod (GreenWaterFixForWATER.esp) after "WATER.esp". PLEASE! Some "Water" mod changes Vanilla water property. This mod's fix is very simple. DO IT YOURSELF, DON'T BE AFRAID, LET'S ENJOY CK! This mod is NOT an essential(or fundamental) solution. True color of underwater will be lost. 1.0, 2012/3/30 - Initial release. 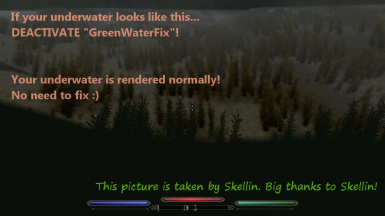 and very thanks to OpticShooter, the author of great water mod "WATER - Water And Terrain Enhancement Redux". and also very thanks to Laast, the author of calm and beautiful water mod "Pure Waters". I also want to say thanks to some "2" residents who gave me a report of this mod's beta release.